Tradition is synonymous with Ursuline High School. Though many years have passed since you walked the halls at 750 Wick Avenue, shared alumni experiences remain. Our students still stand when an adult enters the room and pray the Memorare at the Shrine. And, while the style has changed over the last 105 years, our students still wear uniforms. Ursuline High School is mindful that our connection to our students does not end at graduation. We make a concerted effort to engage alumni ~ whether by invitations to events such as the Annual Auction or Alumni Golf Outing, the printing of the Alumni Quarterly magazine or by asking them to serve on various committees. These efforts keep our graduates connected with both their Alma Mater and with each other. The importance of alumni support can never be understated. Their gifts of time and talent enrich our school community. Their generosity of treasure – to the Annual Appeal, Endowment Fund and Capital Projects – provides us with invaluable resources so that Ursuline High School continues to grow and thrive. Much has changed since 1905 when Mother Vincent O’Connell opened the doors to the Ursuline Academy of the Holy Name of Jesus, a simple day school for girls In the ensuing 100 years, we admitted boys, added a new building while educating students in the Ursuline tradition. We are now 19,000 alumni strong. And we’ve added many new ways to communicate with our graduates: a weekly e-newsletter, Facebook, Twitter, Linkedin – vehicles of communication that the Ursuline Sisters could not even have imagined in 1905. 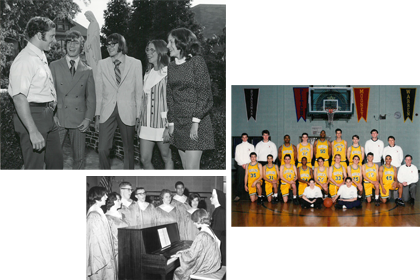 While many things have changed, there are many constants ~ our loyal alumni who while giving back are paying it forward. This support for a school that they love will surely keep the Ursuline tradition alive, thriving and a viable option for future generations of young people who right now are simply dreaming about the day when they will be wearing green and gold. Book a photographer, band and/or DJ. Need help in preparing your invitation? The Alumni Office can help. After the reunion, send your reunion photo to the Quarterly. Consider giving any proceeds to your Alma Mater. 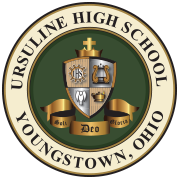 You can request your Ursuline High School transcript. Please be aware that only the alumnus may request an official transcript. There are two different ways to request a transcript. You can request a transcript in person, by mail, fax or by completing the Transcript Request Form. Transcripts to be mailed out can be ordered by mail, fax, or in person. Please click on the link below to print out your request. Transcripts will be processed usually in three business days. Transcripts may be picked up (with photo ID) at the Ursuline High School Main Office on the second floor. Ask for Mrs. Lisa Yurcho, ext. 111. Stay Current With Your Alma Mater And All Our Loyal Sons And Daughters! Please e-mail us at ckorenic@youngstowndiocese.org or fax us at 330-746-8099. Please include your name (maiden name if applicable), class year, complete address, phone number and e-mail address. We want to continue publishing news about alumni, their families, accomplishments and businesses. All Information will appear in the Alumni Quarterly unless otherwise notified. Please fill out and submit the following form with questions you may have or to leave comments.